The profiler is the program used to edit the virtual button panels and assign keystrokes to buttons. Run the profiler by opening Profiler.exe. You should close the profiler before running the main Virtual Button Box program, otherwise panel position adjustments you make in VR may be lost. There is no save button in the profiler, all changes are saved immediately when you click a button, press enter in a text box, or switch to a different text box. The grey portion of the window is the panel preview, which shows what the currently selected button panel looks like. 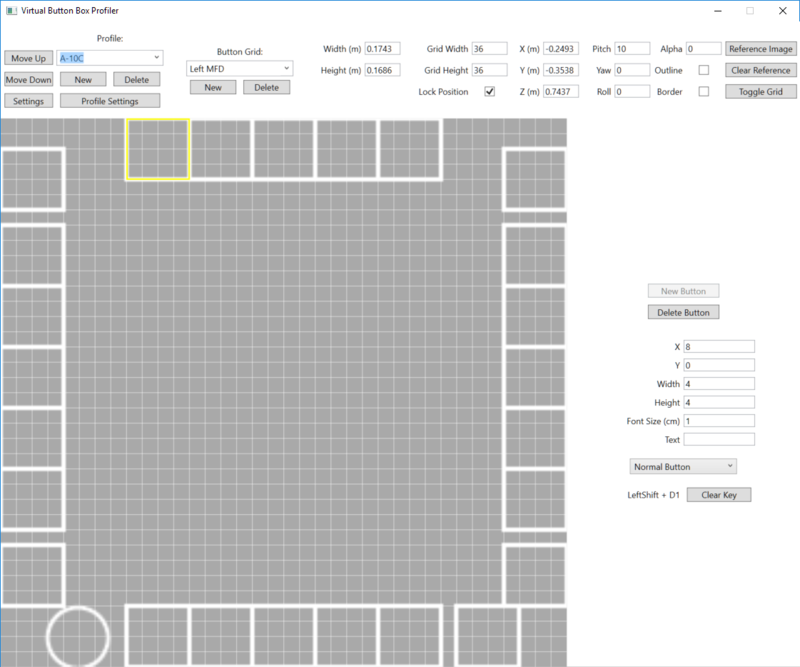 Click in this area to select a button or select an empty grid square. The currently selected button or grid square is outlined in yellow. ・Profile combo box: Selects a profile from the list of profiles. Type into the combo box to rename the current profile. ・New: Creates a new profile. ・Delete: Deletes the currently selected profile. ・Move Up / Move Down: Moves the currently selected profile up or down in the list. This affects the order the profiles will be shown in the profile selection panel in VR. ・Settings: Shows the global settings screen. ・Profile Settings: Shows the settings screen for the current profile. ・Laser Mode: Controls whether the laser pointer or the ball pointer will be used. This can also be changed in VR in the profile selection panel. ・Oculus Touch Mode (experimental): This only changes one thing right now. It disables the requirement to click the touchpad to operate switches, instead the switch will be operated when the touchpad axis is greater than 0.5 away from the center. This should work better with the Oculus Touch joystick but I haven’t tested it on one. ・Hide Pointer (DCS): Used to hide the built-in laser or ball pointer when using the DCS world glove model mods. This is explained more on the DCS World page. ・Pointer Alpha: Controls how transparent the laser or ball pointer is. 1 is opaque and 0 is fully transparent. 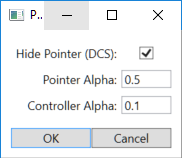 ・Controller Alpha: Controls how transparent the controller position indicator oval is. This is where you add or delete panels to a profile. Controls are the same as adding and deleting profiles. IMPORTANT: A maximum of 32 (I think) SteamVR overlays can exist at once. In a profile with more than about 20 panels, you must set the panels to have alpha 0. This will stop the panels from being rendered and they will not take up a SteamVR overlay slot. ・Width, Height: Controls the size of the panel as it appears in VR, in meters. ・Grid Width, Grid Height: Buttons in a panel are arranged in a grid. This controls the number of squares in the grid. ・Lock Position: Check this box to prevent accidentally moving the panel in VR. ・X, Y, Z: Controls the position of the center of the panel. Positions are relative to the HMD seated position. X is right, Y is up, and Z is forward. You would normally use the in-VR panel movement by pressing the grip button, rather than editing these values directly. ・Pitch, Yaw, Roll: Controls the orientation of the panel. Again you would normally not edit these manually. See the blender guide for information on how to edit these values. ・Alpha: Controls the transparency of the panel. 1 is fully opaque and 0 is fully transparent. Setting the alpha to 0 disables rendering of the panel and does not consume a SteamVR overlay slot. ・Outline: When checked, adds a black outline to everything in the panel. ・Border: When checked, adds a white border around the panel. Reference Image: Adds an image to the panel preview. This is used to precisely position buttons relative to an in-game button panel. See the blender guide for more information. Clear Reference: Removes the reference image. Toggle Grid: Turns the grid lines on or off. ・New Button: Creates a new button at the selected position. You must select an empty grid square in the panel preview to click this button. ・Delete Button: Deletes the currently selected button. ・X, Y: Controls the position of the selected button in the grid. You cannot change these to a value that would cause the button to overlap another button or go outside the grid. ・Width, Height: Controls the width and height of the selected button in grid cells. You cannot change these to a value that would cause the button to overlap another button or go outside the grid. ・Font Size (cm): Controls the size of the button text. This is the height of a character in centimeters. ・Text: Controls the text in the button. Pressing enter in this text box does not apply your changes but creates a new line, to save the text you must click on another text box. ・Button Type Dropdown: Controls the type of button. The available types are: Normal Button, Two-Direction Rotary, Multi-Position Rotary, Three-Way Switch, Multi-Position Switch. ・Set Key / Clear Key Button: Click this button to add a key binding or delete the current key binding. When you click the button to bind a key, a dialog appears. Now press your desired key combination. The key binding will end when you release a key. The number of keys you can press at once is unlimited. NOTE: The order in which you press the keys matters. However, the first key you release will always be set as the final key in the key binding. 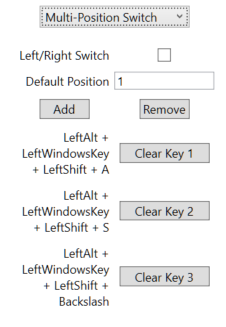 This allows you to bind key combinations that include the windows key without invoking a windows key shortcut. The simplest button type with a single key binding. In VR, this is activated by pressing the trigger. A rotary-type button with two key bindings. In VR, this is activated by holding the trigger and rotating the controller. 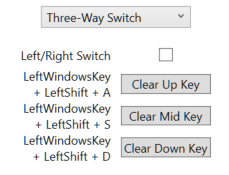 Direction of the rotation determines which key binding will be fired. Rotating the controller more will fire the key binding multiple times. 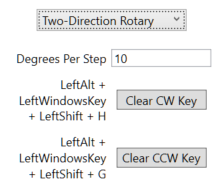 ・Degrees per step: The amount you have to rotate the controller to fire a key binding. For rotaries in DCS that rotate continuously, setting this to 1 degree works well. A rotary-type button with any number of key bindings. In VR, this is activated the same way as the two-direction rotary. The rotary cycles through different positions and fires a different key binding at each position. Clockwise goes to the next position and counterclockwise to the previous. 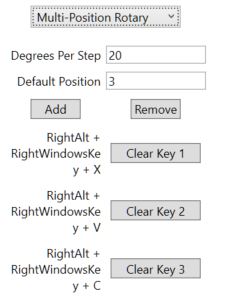 ・Degrees per step: The amount you have to rotate the controller to fire a key binding. ・Default position: The position that the rotary will start in when the profile is selected. ・Add: Adds a new keybinding to the end of the list. ・Remove: Removes the last keybinding in the list. You can’t go below 2 keybindings. A switch with three keybindings. 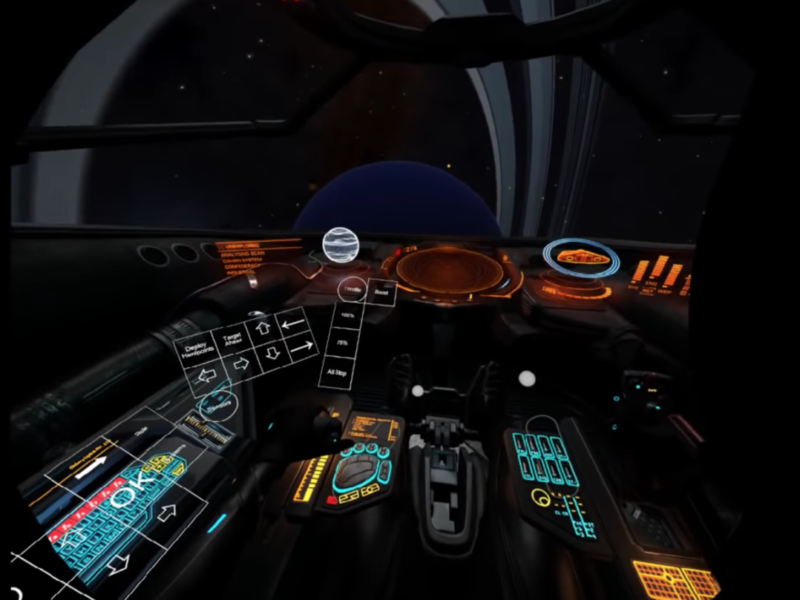 In VR, the middle position is activated by pressing the trigger, while the up and down positions are activated by clicking up or down on the touchpad. It is not necessary to bind all three keybindings. ・Left-Right Switch: When checked, the switch is activated by clicking left or right on the touchpad rather than up or down. This is a switch that works in the same way as the multi-position rotary, except you click on the touchpad rather than rotate the controller.